Wynkoop Brewing Company, 1634 18th St.
Ricardo Garcia-Acosta (Speakers) Intervention Services Manager, Youth ALIVE! Kyndra Simmons (Speakers) Intervention Director, Youth ALIVE! How to start a Hospital-based (or linked) Violence Intervention Program introduces people to the basics of getting a program off the ground, garnering support, and attending to clients. Anne Marks (Chair) Executive Director, Youth ALIVE! Nicky MacCallum (Chair) Clinical Director, Youth ALIVE! Food, fun, and a chance to learn a little about our host city! Joy DeGruy (Speaker) Owner, Joy DeGruy Publications (JDP) Inc. 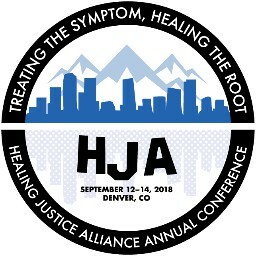 Welcome to HJA 2018! This is the opening plenary. If you find yourself becoming overloaded, or simply want to take some time out for self-care and healing, please visit our Healing Space on the 2nd floor. Anne Marks (Speakers) Executive Director, Youth ALIVE! Doral Myles (Speakers) Violence Interrupter, Youth ALIVE! Lunchtime plenary and networking plus trivia! Join us for a networking lunch, with a brief message from this year's Rashaw Scott Youth Scholarship Winner and a chance to play trivia with your tablemates. Join the Steering Committee and other members of the National Network of Hospital-based Intervention Programs (NNHVIP) for our annual update and discussion of our past, present and future. Breakfast + Don't forget it's Team Gear Day!! Team Gear Day: Wear your program t-shirts, hats, or jackets! There will (*might*) be prizes! Ray Winans (Speakers) Lead Violence Intervention Specialist, D.L.I.V.E. If you find yourself beoming overloaded, or simply want to take somet ime out for self-care and healing, please visit our Healing Space on the 2nd floor. John Torres (Speakers) Deputy Director, Youth ALIVE! We close our time together with reflections from local hero, Cisco Gallardo.